Once we have saved our document, it is possible for us to keep on working on it. We don't have to create a new document. We just need to save any changes we apply to the document. For example, if we write one more paragraph and we want to save that change. b) Click on the Save option. This will save these new adjustments made to our document without having to assign it a new name or placing it in a specific directory. We will do this only if there is no need of changing the name of the document. 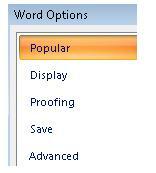 Word presents options which allow us to customize Word functions in an advanced manner. 3. This will show you all the available tool to customize the saving of documents. This function is very useful in case our computer shuts down unexpectedly or if it crashes and we need to restart it. 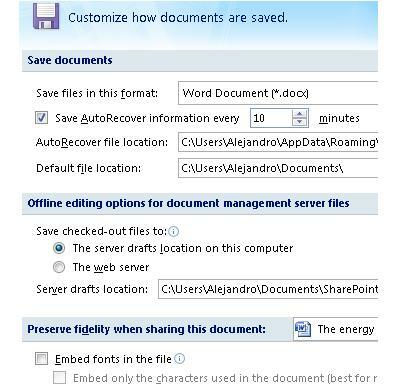 If we were working on a document in Word, once the computer is turned on again and the application is loaded once more, the last version of what was saved automatically will be recovered. Very useful, isn't it? 5. Another option in this group of tools is the AutoRecover file location. In it, we can select the directory in which we want these recovered files to be saved. Once we have customized the Saving functions, click on OK.